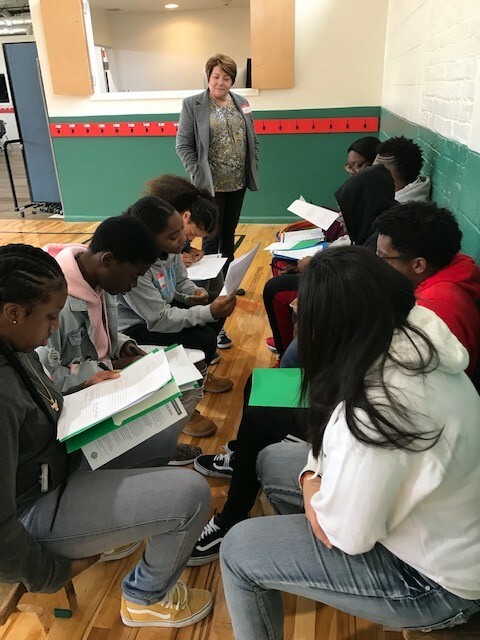 PATERSON – Better tools for education, a level playing field for minorities and employment opportunities topped the list of requests from New Jersey teens during a series of community engagement trainings hosted by A Future With Hope. The program was made possible by a $10,000 grant from the NJ Office of Faith Based Initiatives. A Future with Hope partnered with Rays of Hope, an organization dedicated to engaging youth in community service projects and leadership, and New City Kids in Paterson, an afterschool center that empowers students to become role models. Tara Maffei, a Hope Center Developer for AFWH was a facilitator at the training. “We’re excited to take a first step in partnering with these nonprofits so they can see what A Future With Hope can do and think about the future possibilities,” said Maffei. The two hour training familiarizes students with how to identify a need in a community and used asset based community development to meet the need. Students learned to develop a coalition, sharpen a message and identify partners to help make change including local political leaders, schools administrators, business owners and community organizations. In small groups, teens practice 45 second elevator speeches, condensing and honing their message to succinctly articulate “an ask” of community members or leaders. The sessions, led by A Future With Hope’s Hope Center Developer’s Maffei and Andrea Wren-Hardin, asked students to come up with issues they care about for social change, develop pitches, and explore action steps. The trainings, which received positive feedback, have helped students identify their strengths and their communities’ assets as well as has how to be facilitators and lead groups in disagreement. Leading this effort has been an important step for A Future With Hope which pivoted to community development a year ago. The relationships with related nonprofits and state funding resources will only enhance future projects. The civic engagement training under this grant will continue through September. For more information, visit gnjumc.org/afwh.